Bookmark This Link to Save Current Map View! How do I use KML? Note: The tropical storm cone of uncertainty contains the probable path of the storm center but does not show the size of the storm. Hazardous conditions can occur outside the cone. 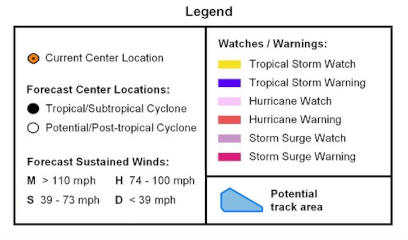 Tropical cyclone positions, forecast tracks, watches and warnings are provided by the National Hurricane Center and/or the Central Pacific Hurricane Center. Search historical meteorological data for observations that meet your threshhold conditions. To view Canadian Historical Data, see Canadian Moored Buoy Historical Data and Canadian Drifting Buoy Historical Data.